Vive's CES 2017 press session was full of good cheer as HTC announced a few interesting new things for Vive. 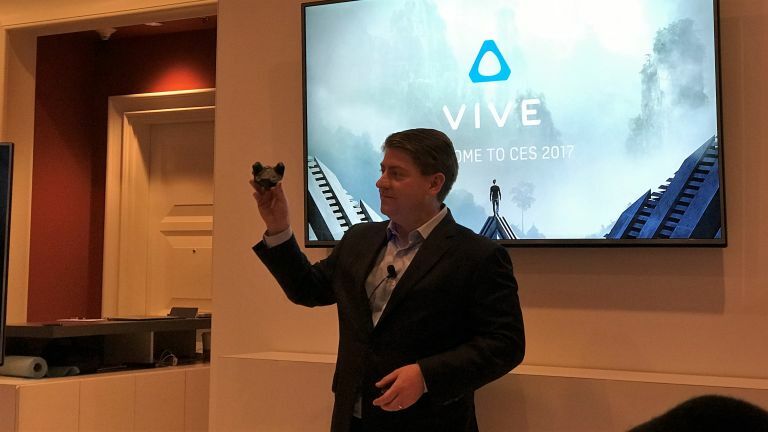 Vive lead Daniel O'Brien said that "we can confidently say that wireless will come to Vive in 2017". That's thanks to partner TP Cast which was incubated through the Vive X accelerator program. This wireless solution includes a one and a half hour battery and latency as low as 2ms. TPCast will be shipping in the next few months and will retail for $249 USD. A more palettable five-hour XL battery will be available at a later date. Vive Tracker was also announced at the session, a new device that will assist the development of Vive accessories - it's essentially a conduit enabling other devices to easily connect to Vive. Pricing of the 85g device is yet to be announced but HTC will give away 1,000 Trackers to developers. Also shown off was the Vive Deluxe Audio Strap which ships with adjustable headphones and has an easier custom fit. Again there's no pricing as yet, but like the Tracker it'll be available in the coming months.